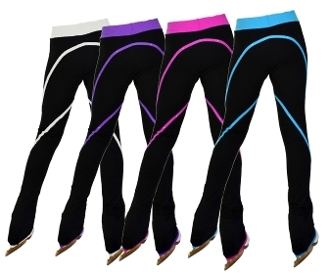 The ChloeNoel P76 Color Piping Figure Skating Pants are made with heavy weight french terry knit inside and jersey face for semi gloss look. Fabric wicks away moisture and resists odor-causing bacteria. Available in several colors from Child XXXSmall to Adult Large. Click on images to see color choices and sizing chart.